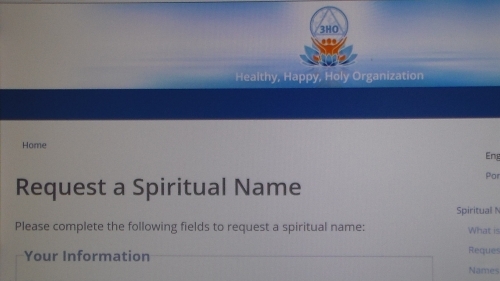 3HO spiritual name request: Just another $$$ making gimmick for Yogi Bhajan's kundalini yoga cult? 3HO is trying to fool people into believing that Yogi Bhajan had some ancient secret method of numerology for seeing your destiny in order to give you the proper spiritual name. This numerology of Yogi Bhajan's is complete nonsense and against Sikh teachings. In the Sikh tradition getting a spiritual name is completely free. All one needs to do is to recite Ardas and then take a Hukamnama from the Siri Guru Granth Sahib Ji. The first letter which appears in the Hukamnama will be the first letter Guru Sahib Ji has given you for your name. If you have further questions please write me or other Sikhs about this process. This review is from: Confessions of an American Sikh: Locked up in India, corrupt cops & my escape from a "New Age" tantric yoga cult! (Kindle Edition) http://www.amazon.com/Confessions-American-Sikh-corrupt-ebook/dp/B00ANSWUPM/ref=zg_bs_158529011_1. "A candid view into the mind of a deceived follower of a notorious fake self-made guru-businessman. I met this Yogi Bhajan years ago in LA and I was very uncomfortable by his gaze that sized up whoever he met for his gains and quickly moved out of his proximity to avoid being exploited. I met some of his abused disciples who had experienced so much pain at Yogi Bhajan's hands and felt really bad for them. Let this book serve as a warning for anyone not to put so much faith in such idiots with grand promises but readily exploit their followers. May you be blessed with Gursikhi and that loving relationship with God Guru Sant Singh and family."